The amount of cars and bikes parked along Atlantic Drive in Katama is a clear indication that South Beach is the place to be in the summer. Get there early for a good spot and bring your cooler, beach games, and summer reading. You’ll want to spend the day enjoying the waves and endless ocean view. If you’re lucky enough to have a pass from the town of West Tisbury to picturesque Lambert’s Cove Beach, well, you know why it’s the best. 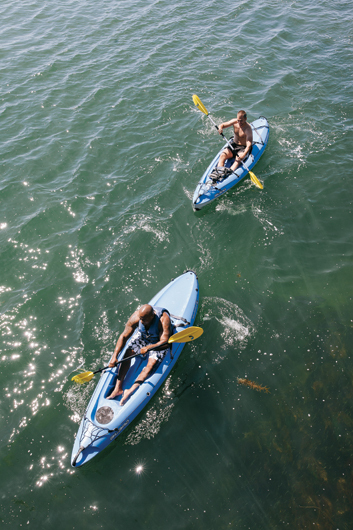 Exploring Sengekontacket Pond by kayak treats you to the best the Vineyard has to offer. With tree-lined coves and waterfowl along the shoreline, a view from land just doesn’t compare to a view from the water. For a similar experience with the crashing of the Atlantic not too far away, Edgartown Great Pond is your best bet. It’s never a dull moment on the open sea with Captain John Potter of the Skipper. Choose from three charter options and you’ll be sure to come back to shore with fish and a fishing tale or two. Runners-up Cooper Gilkes, of Coop’s Bait & Tackle Charters, and Buddy Vanderhoop, of Tomahawk Charters, are both legends in their own right and take small parties out in search of big action. Are you a bike lover? You’re in luck. Wheel Happy has your entire bike renting needs, including child tag-a-longs, adult tandems, and pushbikes. In addition to bikes, Edgartown Bicycles rents out HD video cameras to strap to your handlebars or helmet, so there’s no need to stop to take a picture when you’re crusin’ at full speed. A trip to Cedar Tree Neck can be like a choose-your-own-adventure book. Head right to go directly to the shore, or veer left to explore the wooded areas and brooks. Menemsha Hills’ three miles of trails provide one of the Vineyard’s most challenging hikes. Make sure to stop at the Prospect Hill lookout – at 308 feet, it’s the second highest elevation on the Island. Deeply rooted traditions at Camp Jabberwocky are what make this camp the winner year after year. From the iconic red bus to the whimsically dressed campers in the Fourth of July parade, it’s an Island staple and a first-rate destination for people with disabilities. For campers looking to reap what they sow, the FARM Institute in Katama provides fun, hands-on learning. With the surf pounding against the shoreline and nothing but the Atlantic Ocean for miles ahead, when you’re out at Wasque you may as well be casting your line from the edge of the world. (And that’s a good thing.) Both kiddos and the saltiest of fishermen head to Menemsha for serious time on the jetty. Hoist the sails, take the helm, or just sit back and enjoy the views when you sail onboard the Alabama or the Shenandoah. Choose between an afternoon or sunset cruise for an unforgettable day on the water. In Edgartown, the catamaran Mad Max provides you with sweeping views of the historic harbor and the shores of Chappaquiddick.